Why did B’nai Yisrael receive gifts? Why was it necessary for the Jewish people to leave with gifts? Chizkuni comments on the words “and you shall not go empty”: They will endow you with a gratuity of three kinds: silver, gold and clothing, as is the case with a master’s farewell gift to his freed servant (which was taken from the flock, threshing floor and winepress). We see from here that the “gifts” were just a small portion of what was owed to them for being mistreated and serving as slaves for so many years. Moshe Rabbeinu, Harriet Tubman & Dr. Martin Luther King Jr. Many of us are familiar with “Go Down Moses”, the spiritual song which dates back to 1850 (or even earlier) which served as a code song while Harriet Tubman, known as the “Moses” of her people helped slaves escape through the Underground Railroad before the American Civil War. The song “Go Down Moses” was also used as an anthem during Dr. Martin Luther King, Jr.’s March on Washington for civil rights in 1963 as it had universal appeal for all oppressed people. King used the story of the Exodus to give his followers confidence to fight racial injustice. In his last speech “I’ve been to the Mountaintop” in 1968, right before his assassination, he compared himself to Moses leading the Israelites out of Egypt, going up to the mountaintop but not making it into the Promised Land. “Go Down Moses” has been translated into Hebrew (“Shlach na et ami”) and is sung at Passover seders worldwide. According to Ibn Ezra, the festival that they wanted to celebrate was either Pesach or Shavuot, the celebration of receiving the Torah at Mount Sinai. Rashbam comments that according to Pharaoh, if you want to serve God, there is no reason to bring the women and the children. It didn’t occur to Pharaoh that the women and the children may also want to worship God. Pharaoh believed that the only reason that the entire nation would go out to pray would be if it was part of an escape plan. Bechor Shor points out that Pharaoh only wanted to permit the men to go, keeping the children back in Egypt as collateral. Pharaoh was wrong. When it was time to eat the Korban Pesach (Pascal Lamb), it was eaten by the whole family (not just the men) and the entire nation was commanded to eat matza and not chametz. In addition, all of B’nai Yisrael (men, women and children) were present at the revelation at Sinai. Moshe stood his ground and until today has served as a role model for many leaders throughout the world including Harriet Tubman whose life is celebrated on March 10 and Dr. Martin Luther King Jr. whose legacy was commemorated this past Monday. There are many differences between how the first Pesach was celebrated in Egypt, right before the exodus and how we celebrate Pesach today. 1. Taking the lamb into their homes four days before they were required to slaughter it. After hearing what B’nei Yisrael had to do to prepare for the first Pesach, risking their lives by bringing the lamb which was the god of the Egyptians into their homes for four days, getting the men of all ages circumcised, slaughtering and preparing the lamb, putting the blood on the doorposts and then eating in a rush with one foot out the door makes our cleaning, shopping and cooking for Pesach seem like a piece of cake. As we read through the plagues, we find species that occasionally affect our lives including frogs, lice and locusts. We often encounter these and other “pests” when we are stuck in a bad situation such as when lice are found in a child’s hair, when locusts are caught destroying our plants and when a frog is found in a fresh bag of salad. According to Shmot Rabba 10:7, Even things that you think are superfluous in this world like flies, fleas and mosquitoes are part of the greater scheme of the creation as it says in Breisheet 1:31, “And God saw all that God had created and behold it was very good.” Even though we may think that these species are superfluous, good may come from them. Rabbi Acha bar Rabbi Chanina said, even snakes and scorpions are part of the greater scheme of the creation of the world. Which army did God create? He created all types of species who would carry out His missions. The midrash continues, When God wanted to send the prophets (Moshe, Yirmiyahu and Yonah) on their missions, they were hesitant to go. God said to them, I carry out missions through all types of creations including the snake, the scorpion and even the frog. The hornet (a creature that would otherwise seem superfluous as it does not produce honey) was sent to drive out the Chivi, Cnaani and Chiti. (Shmot 23:28). Frogs, one of the weaker species that may seem superfluous as they are not scary like a poisonous snake, were used to punish the Egyptians, prove Pharaoh’s weakness and show God’s strength. If the frogs were able to cause such havoc, imagine what was yet to come in the plague of the wild beasts! As we begin the month of Shvat, the time of year when we focus on appreciating nature, we are reminded of the fact that every creature has a purpose and we must do our best to respect all of God’s creations. However, I don’t think that anyone would mind if these creations would stay out of our hair and food. Health experts are constantly reminding us that we should stay away from fast food as it is not good for you. Was there fast food in the days of the Torah? Was it healthier than the fast food that we have today? While reading Parshat Bo we encounter two types of fast food that were eaten by B’nei Yisrael at the time of the exodus. According to Rashbam, this shows that they were in a rush to get out of Egypt. We see that on the night of the exodus, dinner was taken care of but they were in such a hurry, there was no time to pack lunch. What fast food did they eat in the desert? They carried the dough on their backs when they left Egypt and baked it into oogot matzot (matzah cakes) when they arrived at a place called Sukkot. Rashbam expains that they were called matzah cakes since they were baked on an open fire. In order to be called bread it would have to be baked in an oven. Breisheet, Parshat Vayera, also deals with the topic of fast food when the angels come to visit Avraham and he quickly works with his family to throw a meal together. Chizkuni points out that Sarah did not make bread as she did not have enough time for the dough to rise since the angels were in a rush to get to Sdom. Avraham therefore asked her to make oogot (matzot). He adds that they served the tongue of the calf because it was quicker to prepare. Rashi notes that the tongue was served with mustard. Can we learn from here that the Torah recommends that we eat fast food? It depends on what we are eating. The Talmud, Pesachim 96a explains that the Egyptian Pesach was eaten in haste, but no other Pesach was required to be eaten in haste. Ibn Ezra states that there are people who think that they should rush through their Passover meal based on the fact that B’nai Yisrael were in a rush. Ibn Ezra bases himself on the Gemara in Psachim to explain that they are misguided and mistaken. Even though we are no longer in a rush the way that we were during the exodus, we still eat quickly baked matzot to remember how fast we needed to escape. 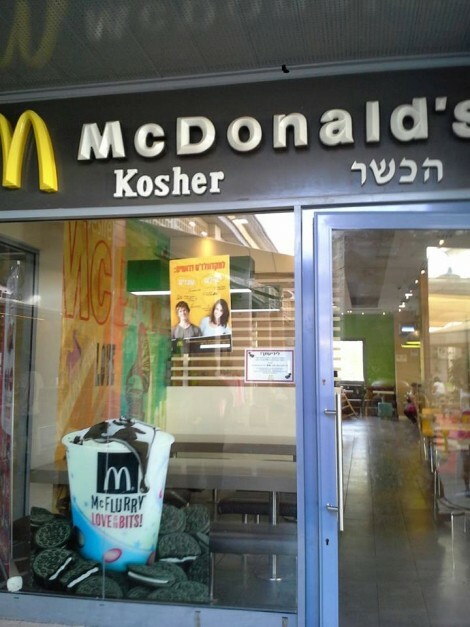 Living in Israel we have access to many kosher fast food chains including McDonalds. While it is convenient to eat fast food, we must remember that the quickly prepared meals in the Torah were the exception and not the rule and that is why their stories stand out. Also, fresh lamb and tongue are much healthier than a processed McDonalds burger even if it is Kosher! In Parshat Bo, we learn the laws that applied to the first Pesach which took place in Egypt. Why does it have to say “draw out” and “take”? Ramban’s explanation is that both words are needed to explain the full physical process of how they got the lamb. According to Ramban, first they had to go all of the way to Goshen to get the lamb (draw out) and then they had to bring it home (take). Rashi brings the Mechilta to explain why both words are needed since each one refers to something else: If you have a sheep, then use it (draw out), if you don’t have a sheep then go and buy one (take). The Mechilta also brings a second, more spiritual explanation: Leave your idol worship (draw out) and take for yourselves (take) a sheep which is a god of Egypt and sacrifice it for the Pesach offering. Before moving on, one must do Tshuva (repent) for what we have done wrong in the past and commit to not repeating that behavior again. The Israelites themselves were responsible in part for deferring their own redemption. First they had to be purified and show by some outstanding act of self-sacrifice that they had repented of their ways. If they were willing to place their lives in danger in order to carry out the wishes of God then, that would be a true token of their love for Him. Consequently, God commanded them to slay the Egyptian god under conditions of the widest publicity. First they had to procure the lamb, lead it through the streets without fear of Egyptian reaction, second, to slaughter it family by family, in groups and finally they had to sprinkle its blood on the doorpost of every Egyptian passer-by to see, braving the vengeance of their former persecutors. Their fulfillment of every detail of this rite would be a proof of their complete faith in God. In the words of the Sages, the blood would be taken “to you” and not to others. Once B’nai Yisrael completed this Tshuva process, they were ready to observe the mitzvot. Converts to Judaism and Baalei Tshuva (newly observant Jews) face the difficult challenge of putting their pasts behind them and committing themselves to become religious Jews. Their challenges are just as difficult as the challenges that B’nai Yisrael faced when the left Egypt. We must give them as much help and support as possible to help them on their spiritual journeys. Please consider supporting Torat Reva Yerushalayim before the end of 2013! With your help we can continue to provide Torah study classes for students of all ages and backgrounds including Jerusalem’s elderly population in senior centers, nursing homes and assisted living residences, people with special needs in group homes and “Mommy and Me” classes for mothers and their babies. Our goal is to continue to expand our programming throughout Jerusalem! Please make checks payable to Torat Reva Yerushalayim, Inc. In Israel please mail your check to Torat Reva Yerushalayim, 12 Yisrael Eldad #19, Jerusalem. How did the plague of darkness work? Did the Egyptians try to light candles? Would candles have worked? Were B’nai Yisrael able to see throughout Egypt or only in Goshen? According to Ramban, the darkness was not a mere absence of sunlight, it was a thick darkness (as it says in sentence 22, choshech afeilah), a thick cloud that came down from heaven. That is why it says in sentence 21, “neteh yadcha al hashamayim”, “stretch out your hand toward heaven” to bring down the darkness which would extinguish every light, just as in all deep caverns and in all extremely dark places where light cannot last as it is swallowed up in the density of the thick darkness. Chizkuni states that B’nai Yisrael had light everywhere, not just in Goshen, as Goshen is not specifically mentioned here. It says in Shmot Raba 14:3 that the plague of darkness was different from the other plagues. If a member of B’nai Yisrael would be in the home of an Egyptian anywhere in Egypt, they would have light there too. Ibn Ezra disagrees with the idea that candles would not have worked for the Egyptians. He says that there was no sunlight but they were able to see by lighting candles. Anyone who has ever been in a blackout or who has had a power failure knows how difficult it can be, even if we are able to light candles or use a flashlight. We see from here that whether they were able to light a candle or not is not really the issue. The point is that being in the dark can be very difficult and even though darkness may occur naturally at some points, the fact that B’nai Yisrael were able to see shows that it was a plague that was specifically directed at the Egyptians. Why is the month called Aviv? Isn’t Aviv the name of the season (spring)? Didn’t B’nai Yisrael know what month it was when they left Egypt (Nisan)? In Israel we really understand the seasons as described in the Torah since at the beginning of Pesach we stop praying for rain and we really don’t see any rain until after Shmini Atzeret (the end of Sukkot when we start praying for rain again). Pesach time is actually a great time to travel to Israel (or within Israel if you live here already!) since it isn’t raining and it is not too hot yet. This past week, we had very heavy rain storms in Jerusalem and snow in the north. Since we are still in the first half of the winter season, Israelis are excited about the rain and continue to celebrate each time another storm heads our way. We know that we need the rain and we know that the rain will be finished by Pesach and will not interfere with our Pesach and summer vacations. We can also learn from this pasuk that Pesach has to be celebrated in the spring- It is not good enough for Pesach to be in Nisan, Nisan must be in the spring. The years that Pesach would have fallen out too early we add an extra month of Adar to make sure that Pesach ends up in the spring. This is a very different concept from the Muslim holiday of Ramadan which ends up being in a different season each year. Leaving Egypt in the spring gave B’nai Yisrael the opportunity to start off on the right foot! In Parshat Bo,God told Moshe (Shmot 11:2) “Please speak in the ears of the people: Let each man request of his fellow and each woman of her fellow silver vessels and gold vessels”. The gold, silver and clothing that B’nai Yisrael took out of Egypt can be looked at as payment for all of the years that they worked for Pharaoh without being paid. We don’t see objections from the Egyptians as they knew that B’nai Yisrael deserved payment for their labor. Once B’nai Yisrael took the objects and left Egypt, they were ready for the next challenge that God promised to Avraham, that the fourth generation would return to the Land of Israel. When reading the Parshiot which deal with the plagues and the Exodus, one may wonder why it is necessary to hear the story now and then again on Pesach. Actually, the mitzvah of remembering the Exodus from Egypt is performed every day when we recite the end of the Shma (Bamidbar 15:41) “I am your God who removed you from the land of Egypt to be a God to you”, when we recite the words immediately leading up to the Shemoneh Esrei, “From Egypt you have redeemed us, Hashem, our God, and from the house of slavery you liberated us…” as well as when one wears Tefilin or posts up a Mezuzah. Parshat Bo ends with a question familiar to us from the Hagaddah (Shmot 13: 14, 16) “When your son asks you at a later time saying ‘What is this?’ You should say to him, “With a strong hand God brought us out of <?xml:namespace prefix = st1 ns = "urn:schemas-microsoft-com:office:smarttags" />Egypt from the house of slavery…It shall be a sign on your hand and Totafot between your eyes, for with a strong hand God brought us out of Egypt”. (Tefilin) as a remembrance of the Exodus, on the place indicating the subjection of the heart and mind. Nehama Leibowitz brings up Rav Kook’s view that the Exodus was not just the deliverance from political subjection to freedom. Rather, the Exodus was a deliverance from spiritual subjection, from being sunk in the mortar of a gross material existence. Each day, we are still fighting the battle between materialism and spirituality. The events that have taken place over the past few months (economic downturn, misuse of funds, the war in Gaza) remind us of what is really important. Each time a mall is built in Israel there are complaints about the country becoming too materialistic. During the war, we saw a different side of the shopping malls. Stores were collecting full boxes of toys to be sent to the bomb shelters and supermarkets were selling food that would go into care packages for soldiers fighting in Gaza at half price (and free delivery!) With the proper focus, materialism was transformed into spirituality. into every day of our lives! In Parshat Bo, Shmot 10:8, Pharaoh asks Moshe who he would be taking to the desert to worship God. Moshe’s answer is (10:9) “With our young and with our old we will go. With our sons and with our daughters, with our sheep and with our cattle, for it is a festival to God for all of us.” Pharaoh then suggests that only the adult men should go. Yismach Moshe brings down the Gemara in Shabbat 119b, Rav Hamnuna said: Jerusalem was destroyed only because they diverted the schoolchildren (tinokot shel beit Raban) in it from their Torah studies. The author of Prashat Derachim said that because of the merit of the schoolchildren, the Shechina, Divine Presence, rests on Israel. When the Shechina is present, no other nation can try to control them. When Pharaoh asked who was going, Moshe answered that the children as well as the elderly would be going since it is only truly a holiday when the children, the next generation is with us. Only when we are with the children will we have the Divine Presence resting upon us. We can learn a lot about spirituality by simply watching the way that children can connect with God. The other day while we were driving in the car, my four year old son, Moshe looked out at the sky and began to have a conversation with God. How many times do we as adults wish that we could do that? We learn from Parshat Bo that spiritual experiences- prayer, the celebration of the holidays etc., should be done as a community- where the young and old can all join together. If joining together as a community means that sometimes you will hear a baby cry during Shabbat services or children in costumes making a little bit of noise on Purim, don’t worry- it is because of the children that the Shechina will rest there (anyway the children are probably not making half as much noise as the two adults talking in the back row!). The first Mitzvah that is formally given to Moshe even before the Jewish people leave Egypt is the mitzvah of Rosh Chodesh (the new moon). "This month shall be reckoned to you as the head of the months. It shall be to you the first of the months of the year (Parshat Bo-Shmot 12:2)." According to Rashi, God showed Moshe the moon at its renewal and said to him, "When the moon renews itself, let that be for you the beginning of a new month." How did Rosh Chodesh become a women's holiday? At the time of the sin of the golden calf, only the men participated and not the women. As it says in Shmot 32:2, "Aaron said to the men, "Remove the golden rings that are on the ears of your wives, your sons and your daughters and bring them to me. All the people removed the golden rings that were on their ears and brought them to Aaron." Rashi comments that Aaron thought to himself: the women and children fancy their jewelry, perhaps, the building of the calf will be delayed and in the meantime Moshe will arrive. But the men did not wait for the women and children and took their jewelry off themselves. According to Pirkei D'Rebbi Eliezer, God rewarded the women with the observance of the holiday of Rosh Chodesh. Many women took on the custom of not working on Rosh Chodesh. According to the Shulchan Aruch 417, it's permissible for women to work on Rosh Chodesh, but it is a meritorious custom for women not to. Biur Halacha states that every Jewish woman should refrain from some kind of work on Rosh Chodesh, so that there is a difference between that day and the other weekdays. What about the men? According to P'ri Chadash, for the men Rosh Chodesh is like any other weekday and for men to refrain from work is a custom based on ignorance. What was the true test to see if the women would give up their jewelry for a good cause? In the building of the mishkan, tabernacle, it says "The men came .al hanashim', after the women, all who were generous of heart brought bracelets, nose rings, finger rings and buckles- all kinds of golden vessels. (Shmot 25:32). When it was for the sake of a mitzvah, the women were the first to give their jewelry. Today, many women have revived the observance of Rosh Chodesh as a women's holiday. Throughout the world there are women's study groups that meet on or around Rosh Chodesh to celebrate the new moon and to focus on the significance of the month ahead. Please contact us if you would like to join a Torat Reva Rosh Chodesh group in Jerusalem.